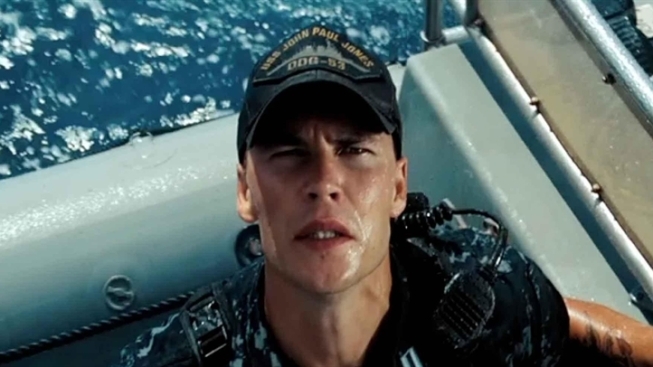 "Battleship" stars Taylor Kitsch as a Naval officer serving on the USS John Paul Jones (why'd they name a ship after a member of Led Zeppelin?) under the command of Liam Neeson, who also happens to be the father of Kitsch's fiance, Brooklyn Decker. And Alexander Skarsgaard is the CO of another ship, the USS Sampson, whose weapons specialist is played by Rihanna. And the trailer is even more ridiculous than that. We weren't expecting the film to feature Taylor Kitsch yelling, "You sank my battleship!" at some other guy, but we also didn't think that director Peter Berg was gonna try make "Transformers at Sea." "Battleship" opens May 18, 2012.